An awesome place to spend a week or more on the beach. 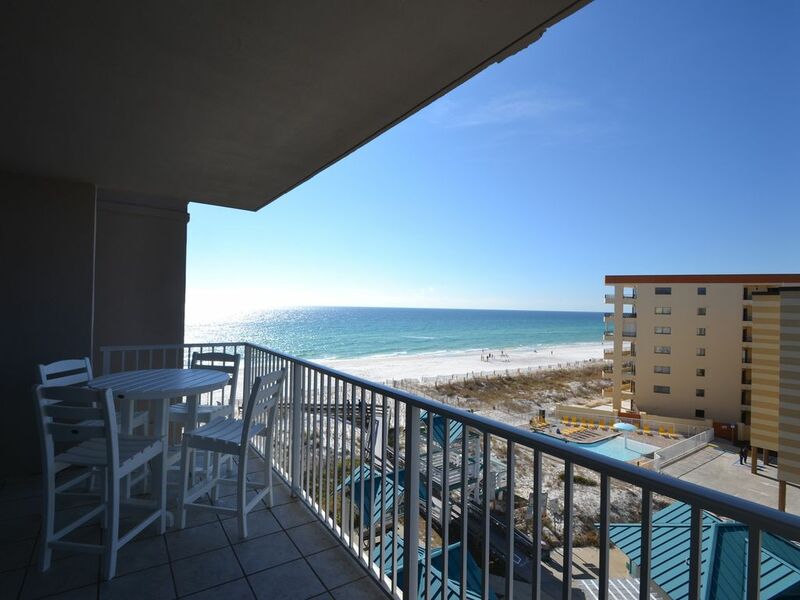 Bring your family to The Beach at our Fort Walton Beach condominium on the Emerald Coast. Lots of room for all, perfect for one or two families. We have three bedrooms, each with its own private bath. Middle BR is great for kids and teens. It has a set of bunk beds and a full size bed (sleeps 4) and a flat panel TV. Master BR has a King Sleep Number Bed from Select Comfort (sleeps like a dream). Spacious queen bed is in the front BR. Fresh paint throughout plus new vanities with granite tops, new mirrors, and new lights in all 3 bathrooms. New pictures now up for viewing. Our extra large balcony location provides the best of all views, a great view of the beautiful emerald green waters of the Gulf of Mexico and the Intracoastal waterway and Fort Walton Beach across the way. Wake up from the Master BR and Wow...... what a sight- straight out to the beautiful Gulf. And of course, am awesome view from the balcony and the living and dining rooms. There is so much included with our unit, it is difficult to list everything. Covered reserved parking makes it nice when the weather is a little warm or when a summer shower catches you on the way back from shopping or a wonderful seafood experience at Crab Trap or Floyd's Shrimp House or Rock-N-Tacos nearby at the boardwalk. AJs Oyster Shanyt is less than a 1/2 mile down Santa Rosa Blvd, great seafood. The Original Crab Shack just across the Brooks Bridge in Fort Walton Beach old downtown or many others. Full size front loader washer & dryer - included for your convenience. Safety Grab bars - included in all 3 bath tubs. www.homeaway.com/3495059 Please take a look. Or ask John for a direct link. Every bathroom has a hair dryer. Very nice location and clean condo. It has everything you need for a great vacation! We ❤ Okaloosa Island and this is our 2nd time at Island Princess 617! John & Cindy are great people and take care of anything you need! We already want to go back and can't wait till next year! Awesome view. Awesome sleep number bed. Okaloosa Island is located 10 minutes west of Destin and 35 minutes from Navarre, across the Brooks Street Bridge from downtown Fort Walton Beach. The Island has a family environment, not too overloaded with crowds. Buildings are limited to 7 stories. Santa Rosa Blvd stops at the Air Force Base, so no thru traffic. There are restaurants, a Boardwalk, bars, a fishing / viewing pier, and a Marine Acquarium. Other Activities: Sun bathing, swimming, walking or just relaxing at the beautiful emerald water of the Gulf of Mexico. Watch for the dolphins frolicking in the Gulf from your balcony. Mini-golf only 5 minutes away. How about bungie jumping or Go Karts, or Big Kahunas Water Park? Deep sea fishing is available on bottom boats or individual charters. Take a tour into the Gulf on a Pirate ship or even a boat for Dolphin watching. Near by military museum available for you to spend a morning or afternoon (FREE). Less than an hour to the Pensacola Naval Air museum (FREE).